Skipped some runs this week, not gonna lie, but had an awesome long run yesterday and am feeling good! Last week was incredibly busy for me so I did what I could. Monday: Scheduled –> 35 min. XT + 25 min. strength. Actual –> Took off. Tuesday: Scheduled–> 3 mile fartlek run. Actual –> I took a 45 minute. battle ropes/tabata class as part of my SweatPink ambassadorship, so I counted it as XT…stay tuned for the review! Thursday: Scheduled –> 3 mile run. Actual –> 2 mile run + lifting. Felt awful. The heat and humidity got to me AND I was not the best with nutrition that day. Let’s just say the night before I ate multiple cookies, and during the day on Thursday I had multiple cookies…what a horrible run. Can you tell I have a sugar problem? We did lift so at least that got done! Saturday: Scheduled –> 35 min XT + 25 lifting. Actual –> 30 minutes of tennis with my mom (as XT). The tennis bug has definitely bit us after watching the US Open live! There was also a Rutgers game (season opener) so that’s where I was during the day…so pumped football season is here, and that Rutgers will be playing in the Big Ten! Sunday: Scheduled –> 6 miles. Actual –> 6 miles. Felt awesome! I was kind of dreading this run but it turned out to be a great run with my mom. Kept it below 11 min./mile which for us, right now, means we are slowly getting back into shape! I just checked my training calendar for the next two weeks that Coach Marc laid out, and I’m excited! Finally some tempo runs and track workouts. I love track workouts. Tempo runs…not so much…but I like that they make me faster and a stronger runner. I’m still on my runner’s high from my 6 mile run earlier. Finally feels good to be running again, as opposed to trudging along hating the fact that I feel so out of shape. What is your college alma mater? Any RU alums reading? Tuesday was my first run in who knows how long. I mean, I ran while in Paraguay (once), and probably a few times in the past couple of months since the New York City Marathon, but I really haven’t been consistently running at all. Therefore, those 3 miles on Tuesday were tough. 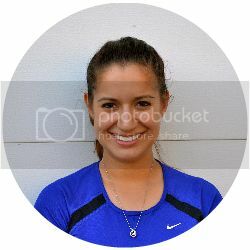 My sister and I ran together, and if she wasn’t with me, I probably would have taken a few walk breaks…but my competitive spirit got the best of me The first mile was all uphill, and I felt so out of shape most of the time. But hey, my own fault for not keeping up my base! Turns out the plate was way too big. Oops Will use the bar next time. Speaking of Marc, I will leave you with a quick message, and exciting opportunity, from him…check it out! Hi RYP fans! I wanted to share a great offer with you – and it doesn’t last long, so you’ve got to move quickly. Are you training for a fall race? Which one? Tell me in the comments below! I love running. I do. 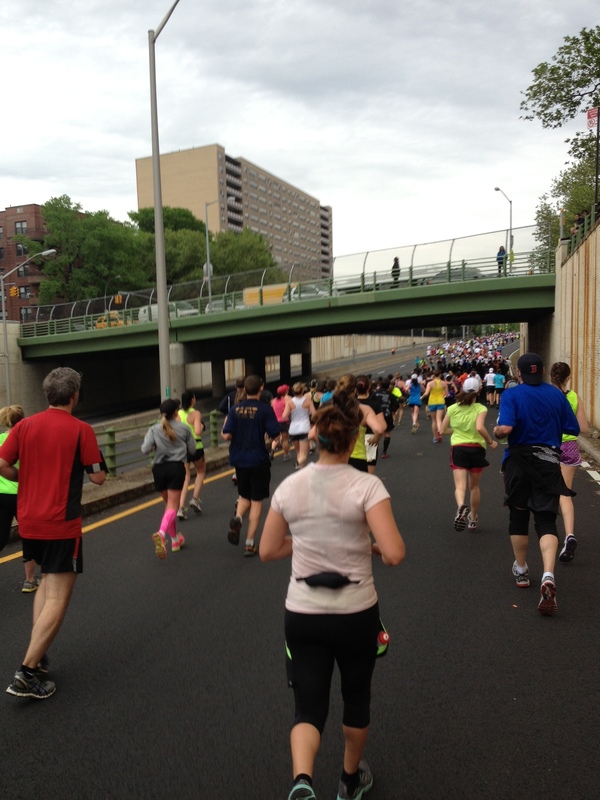 But after the Brooklyn Half Marathon, I needed a break from running. Towards the end of half-marathon training, I wasn’t looking forward to runs anymore. It was more of a task than fun, and that’s how I knew. I wanted the half to be over so I could take a break and go back to lifting. I knew I needed to start marathon training towards the end of July…and I could have and probably should have kept running a little bit to keep my base, but I just needed to get away from it. I love running and I want to feel excited for runs, and I just wasn’t there anymore. So I took a month and a half off and did other things, like cardio/strength workouts that focused on different forms of cardio, like burpees (hate). 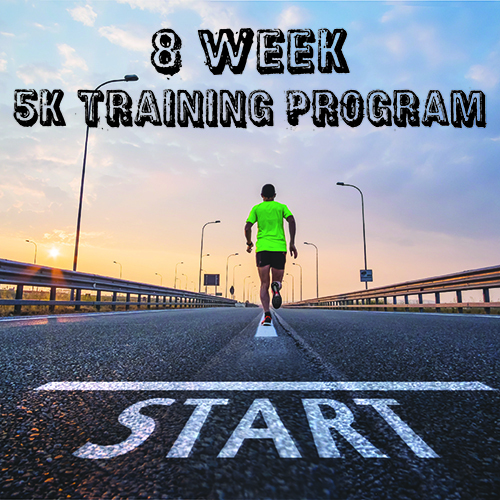 I loved seeing my improvement in lifting and reps.
Then, once I picked out my half marathon training plan, I started getting excited about running again…and all of a sudden, I couldn’t wait for training to start again! I’m only in week 2 of training but I am excited for each run so far. My goal is to PR at the New York City Marathon, so that will fuel my runs as well. I definitely needed that time away from running to feel this excitement again. Because, honestly, after the half I was like ugh I have to start MARATHON training now?!? Isn’t it funny how it almost sounds like a relationship? Then I made myself a nice breakfast…egg white scramble with mushrooms topped with salsa, and an apple with almond butter. Yum! This is the first week I will be running Thursday-Sunday! Hopefully it goes well and my body adjusts to running in the heat. Have you ever needed a break from running? Or any sport? Or can you run all year round? Ok, I have finally gotten around to writing this recap! Let’s just jump right into it. So we woke up at 4 am on Saturday morning, which was the earliest I have ever been up for a race. I went to sleep at 9:30 the night before, but was tossing and turning a lot thinking about this race. Do you get actual sleep before race day? We used the restrooms and then basically just hung out in our corral. I really liked that each corral had their own set of bathrooms. It didn’t get too packed or have crazy lines which I was expecting if they just had a long row of them outside of the corrals for everyone. Our corral was set to start at 7:30 am. As the time got closer, I got more and more nervous. Not necessarily because I wanted to PR (which I did) but because I just wanted to finish and not have to stop because of shin pain. My plan was to do the first 5 in 9:30 pace then pick it up to 9:20 pace. Well, I thought I could do this during the first 4-5 miles. Then Prospect Park happened. I was expecting hills, and I train on hills but for some reason these hills just really slowed me down. One in particular was super long, like probably half a mile (maybe a little less). 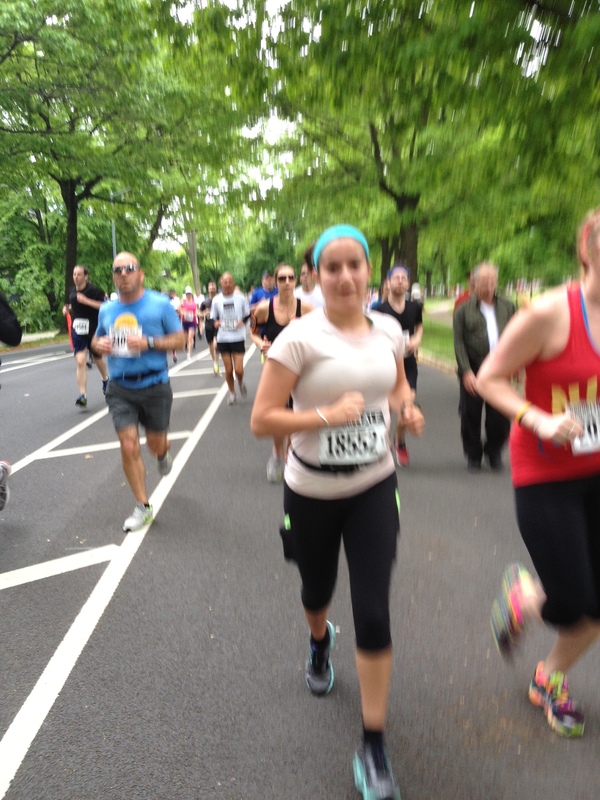 Once we got out of Prospect Park we were at Mile 7 and it was pretty much flat but the damage was done. I was beat, it was hot and humid, and I was sweating A LOT aka losing a lot of water and salt. Isn’t my shirt drenched with sweat so attractive? :-p The humidity definitely started slowing me down. I was glad we were on the parkway heading straight to Coney Island, but personally, I thought it was pretty boring. It seemed as if it lasted forever. But, at the same time, the miles did tick by quickly. I don’t know how to explain it haha. I was glad that we were at Mile 7 after the hilly park, because if it was Mile 4 or something I would definitely feel defeated. Anyway, so yeah the parkway stretch was boring. At mile 9 we had to stop and walk to fuel and just take a break. My mom’s knee was bothering her as well. Once we started running I made a pact with myself that I would run until the next mile, then walk a short break, then run to the next mile again. I kept telling myself it was just a treadmill working. Just hold on for a few more minutes then you get a break. At mile 11 I knew we had only 2 more miles. I WANTED to run the whole way but I just couldn’t catch my breath with the humidity. What is so frustrating about this race was that my legs and shins felt great. But I just couldn’t get my breathing right. Also, at Mile 8ish we knew we wouldn’t hit our time goal of around 2:05. I would be happy with anything around our original half marathon time. At Mile 11, I really thought we’d finish 2:15. RANDOM NOTE: There were NYPD officers around Mile 10 who were cheering on runners and yelling out, “DO NOT WALK. YOU WILL GET A SUMMONS.” That gave me a little pick me up. I love spectators. So then we finally made it to Mile 12. There were a ton of spectators on the road entering Coney Island which really helped me speed up a little bit and not walk at all in the last mile. I saw the sign that said, “800 Meters To Go” and was pumped. I thought, ok just 2 laps on the track. I can do this. I always break things down into laps on a track when my mind needs a little help. Then, I saw the ramp up to the boardwalk. SO CLOSE! This is another complaint, however. The ramp was not big enough for how many runners there were, so we had to all slow down A LOT. Like, almost walking. I got to the top and my mom and I sprinted as hard as we could to the finish. 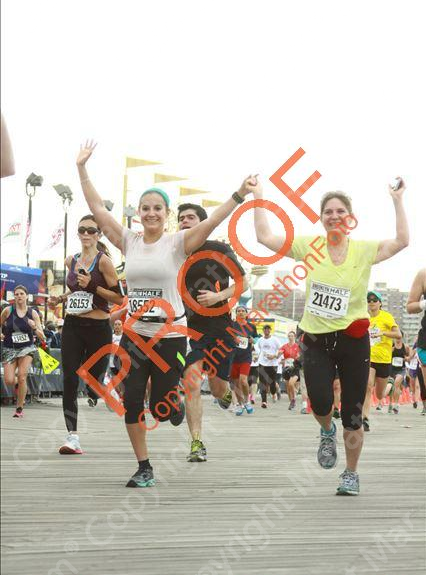 We also FINALLY remembered to raise our arms up for a posed finish picture. In the 3 halfs and 1 full we have done, we always have forgotten to do this. And then, we finished! My mom’s stopwatch said 2:11 and I was honestly shocked. I thought we finished around 2:15 because of how our pace slowed. Our official finishing time was 2:10:56 which was basically our 1st half marathon time from 2011, which was also way flatter (2:10:58). I’ll take it! We got our medals then kept walking. My dad and brother were at the finish and took a lot of photo and video of us. I love when our family comes to support us! The good thing about the day was that it was cloudy the whole time. The bad thing was the 70% humidity. But what can you do, race day is always a toss up of whether you will get perfect conditions or not. We had to leave right after the race so we didn’t get to experience any of Coney Island. Sad. I put on my new compression socks by 110% and iced in the car. I will be writing a review on this product very soon! I had a few stomach cramps for a few hours after the race, but made sure to get in some protein in the car and ate some eggs. Other than that I couldn’t really eat until dinner that night. The next day, I was a little bit sore but not much, and the third day I was perfectly fine! Best I have felt after a half marathon. So, at least my body has gotten used to the long distances! So that’s pretty much it! I would rate this race a B. 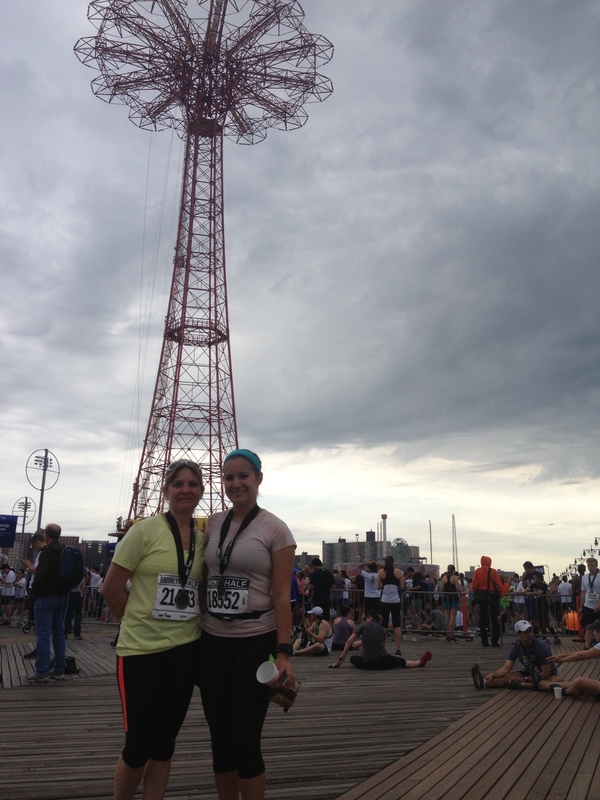 The route wasn’t anything to write home about, but the finish on Coney Island was pretty cool. I was disappointed with my time, but then realized, hey, my body just ran 13.1 miles and feels mostly fine after. I need to give myself credit. Plus, I didn’t even get my worst time ever which was what I was expecting. Overall, it was a good day, and I’m happy I felt so good afterwards, as opposed to how horrible I felt after NYC Marathon. Who else ran Brooklyn? What were your thoughts on the course? In general, are you disappointed when you don’t hit a time goal? But anyway, I was glad I was actually able to finish my 11 miles after 2 weeks of not being able to do a long run due to my calves burning (wtf??). We did a large 6 mile loop that ended back at my house, and I stopped for a few minutes there to change my shoes. Then we did another 5 miles at our local park. I love running there, it is so scenic! I have my half marathon training class today and was planning on just walking or doing an easy 3, but I forgot my sneakers and my knee is hurting anyway, so I won’t be running. So happy I got my 11 miles in! 12 miles up for next week.